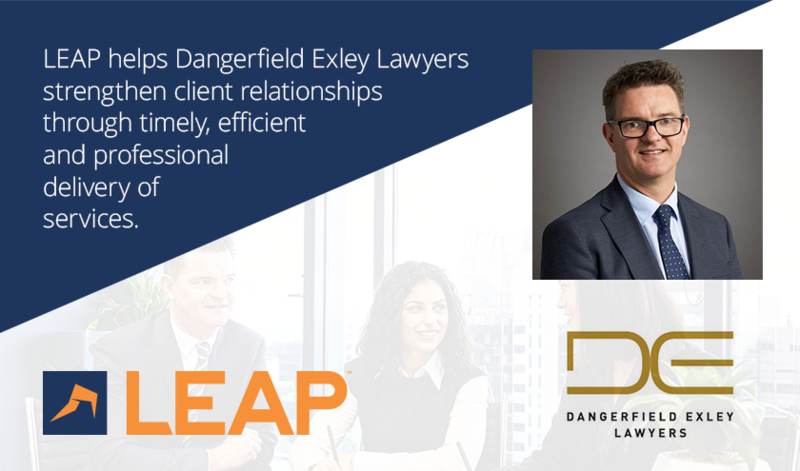 Dangerfield Exley Lawyers’ vision to provide practical legal solutions with the utmost integrity led this firm to choose LEAP. Dangerfield Exley Lawyers’ approach to legal services is different – this firm prides itself on high service standards to its client base, with personality and integrity. The firm creates transparent solutions to resolve legal matters; simple and complex matters are all treated with the same refreshing approach. Co-founders Steven Dangerfield and Simon Exley built their business model to fulfil this vision. They offer unlimited legal access through fixed-fee costings and promise to be responsive to clients’ questions within very short timeframes. This may sound simple, however being available for telephone calls or impromptu client visits can be quite difficult when you consider third-party delays and pressing time commitments. Steven Dangerfield explains how LEAP has enabled his firm to succeed at providing the highest level of client service. and communication and accountability internally within our office. Partner Simon Exley describes the importance of keeping a focus on client service while your firm experiences growth. This is the point where some firms can come undone. As our business grows, LEAP enables our office to refine processes and procedures that give us the capacity to turn over higher volumes of work. The cloud version of LEAP has provided more flexibility to our operations. LEAP’s practice management platform provides structure and accountability for this multidisciplinary law firm and helps Dangerfield Exley Lawyers strengthen client relationships through timely, efficient and professional delivery of services. Click here to learn how LEAP’s document management will streamline your firm’s processes. Watch the webinar to see how easy it is to automate your letters and precedents, freeing up your time to focus on what matters.